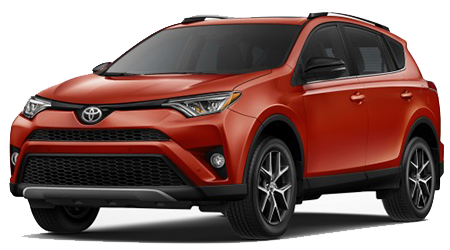 Our Venice, FL Toyota dealership invites you to experience car buying the way it was intended to be: a no hassle, exciting process that leaves you with a quality vehicle, like the 2016 Toyota RAV4. The RAV4, or Recreational Active Vehicle with 4-wheel drive, has been designed to not only meet all your expectations but exceed them. This is a reliable choice when looking for a commuter car that can handle that morning commute or one that can head for the mountains for a weekend camping trip. This versatile vehicle has both the style and power you’re after, so head over to our convenient location today to get started on your search! We strive to provide you with a vast array of options to choose from, and to make the process a fun and exciting one. That’s why we’ve designed a website that enables you to shop from the comfort of your Florida home. Why wait, check out our RAV4 inventory online; you can even narrow down your results by inputting your search criteria. Call our friendly sales team to hear all about the impressive features of this rugged ride today, or schedule a test drive now! We look forward to assisting you in finding your Toyota soulmate. The 2016 RAV4 delivers power to where you need it, and stylish comfort features where you want it, making it a quality choice no matter what you’re driving habits are. For starters, the 2.5-liter 4-cylinder engine is more than capable of handling your needs, not to mention the impressive 176-hp it delivers. Looking for control and responsive handling no matter what the elements are? Opt for the All-Wheel Drive system and Dynamic Torque Control! These systems maximize traction by working together to distribute power between the front and rear wheels, and the upgraded suspension of this Toyota means one smooth ride. With so many options and features to choose from, customizing your Toyota is a breeze; there are even selectable driving modes, meaning as the road and your mood changes, so can your vehicle. While style and design are factors when it comes to purchasing a new Toyota, you’ll want a vehicle that has been structured with your safety in mind. The RAV4 delivers. In the rare event of a collision, the RAV4 has an impressive total of eight airbags that will work together to help protect you, and not just your torso like other standard airbags. This car includes airbags for your lower extremities, helping to shield your entire body from harm. Opt for the Rear-Cross Traffic Alert system so you can “see” what you couldn’t before. This audible system will alert you to any potential traffic or pedestrians as you back up, so now you can do so confidently. The add-on Blind Spot Monitor will work with you during any lane changes, to ensure not only your safety, but those around you. We don’t all do our driving during the day, so check out the features that can assist you when the sun goes down! The auto high beams can detect on coming traffic and switch themselves off to protect you and the approaching driver. Once the obstruction has cleared, they’ll come right back on, illuminating your way. With the radar cruise control you can stretch your legs to make those long trips comfortably. With this feature you can not only set a cruising speed, but you can also set a distance length. As you approach other vehicles, the distance length will trigger, slowing the vehicle down. Car in front of you switches lanes? Your RAV4 will compensate by speeding back up to your original cruise speed. With all these elements helping to keep your Toyota safely moving, you might just forget you’re driving. We aim to provide safe vehicles at an affordable price, and because your safety is so important to us, all 2016 RAV4 models come standard with the Star Safety system, which integrates many different impressive elements. The Traction Control and Anti-Lock Brakes for example, are important features that can potentially stop an accident. Experience this vehicle for yourself, and come in for test drive today. Our dedicated staff is standing by, ready to assist you, so head on over from your Sarasota home today! Start your trip off right, by using the height-adjustable liftgate to load your luggage into the cargo area. Now our taller drivers don’t have to worry about bumping their head while they load goods in and out, just set the height you’d like the gate to open to and the system will remember your preference. Finding the cargo area is filling up? The 60/40 seats can provide the extra space you’re looking for in a variety of configurations! Fold one or both down, depending on your needs. As you’re ready to begin your journey, use the Smart Key system to get your RAV4 started with the push of a button. As you cruise down the road, be sure to utilize the newly designed cupholders that have been improved to hold a variety of different shaped drinks and mugs. Adjust the 8-way adjustable seat to ensure comfort and proper lumbar support as you open up the moonroof to let the fresh air in. You can rest easy on your getaways, thanks to the available HomeLink system, where you can close that garage door from miles away, giving you peace of mind. The heated front seats and dual zone automatic climate control ensure your passenger’s comfort as well as your own. There’s no reason to put off those long road trips any longer, thanks to the 2016 Toyota RAV4! Start your search using our online system today and be sure to ask our friendly staff any questions that may arise. Own the Toyota you’ve always wanted, come visit our Venice, FL dealership today! Our team is here to assist you in all aspects of the car buying experience, so whether you’re looking for a loan or are interested in trading in your current vehicle so you can get your hands on the RAV4, we’re here to help! We proudly serve our Bradenton, North Port and Port Charlotte neighbors, so head on over today for a test drive and leave with the 2016 Toyota RAV4 tonight! We look forward to welcoming you.